Thornborough, North Yorkshire – May 5th, 2017 – Thornborough Cider, made in the small village of Thornborough near West Tanfield, has taken a silver medal in the 12th Annual Great Lakes International Cider and Perry competition held last month in the USA. Thornborough Cider is a dry, sparkling cider made from only locally-sourced apples. It is crafted from over fifty different kinds of apple, including several old Yorkshire varieties, and is pressed, fermented and bottled using traditional techniques. It has previously been recognised in competitions including the Flavours of Herriot Awards, the Three Counties Cider Competition and the Manchester Cider and Perry Festival. There has been significant growth in the craft cider industry in recent years, with a proliferation of small producers and many more pubs, bars and restaurants choosing to stock local cider. To keep up with this increasing demand, Thornborough Cider has planted 400 apple trees in the village to help expand production. These will be used along side the existing scheme in which local apple tree owners can contribute spare fruit in exchange for a share of the resulting cider. 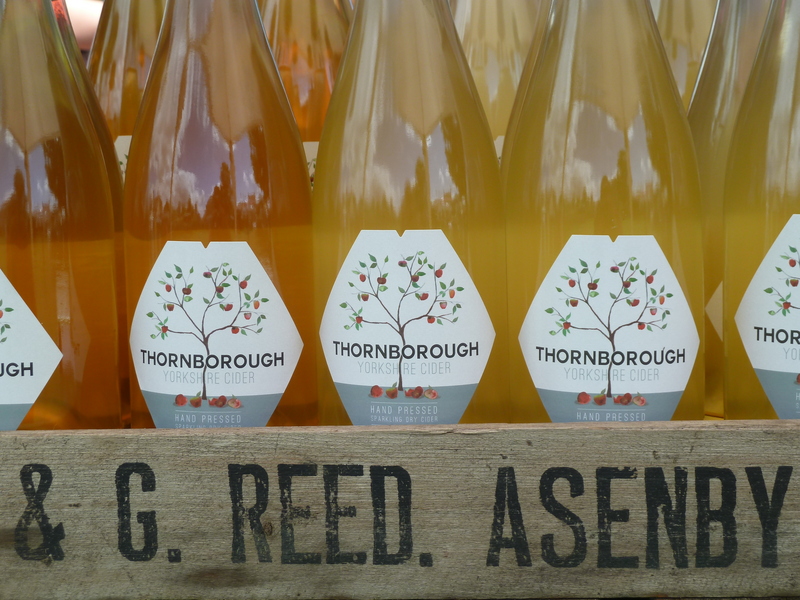 Thornborough Cider is available at restaurants, bars and shops around Yorkshire and beyond, and will be appearing at the Malton Food Festival in May and the Yorkshire Dales Food and Drink Festival in Skipton in July. 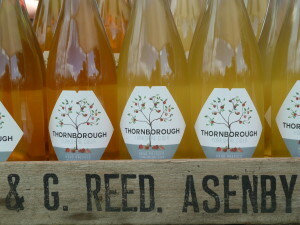 For more details visit www.thornboroughcider.co.uk or find us on Facebook and Twitter. Come and find us in the gardening hall at the Harrogate Autumn Flower Show this weekend, where we’ll be doing an apple pressing demonstration and selling our fine cider. See you there! 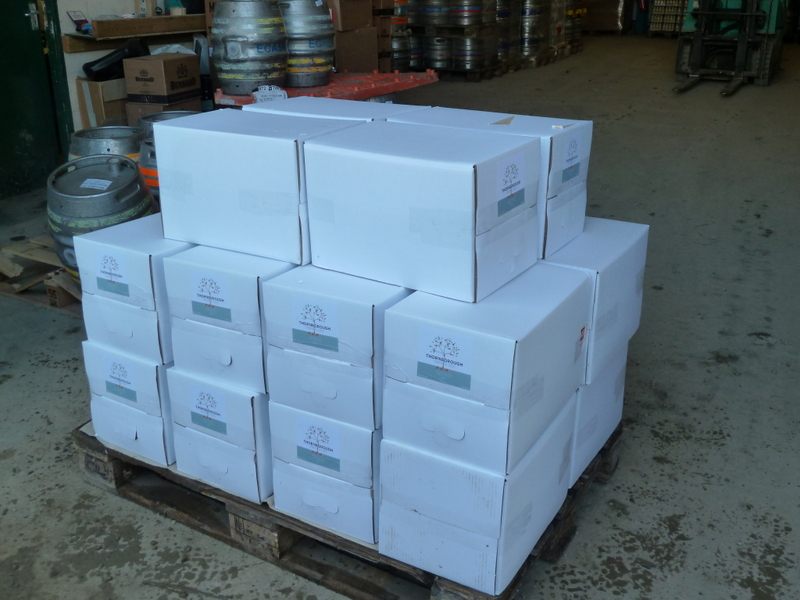 400 litres of Thornborough Cider ready to go to the thirsty people of York, Harrogate, Leeds and London! September 26, 2014 / Kingsley / Comments Off on Apples Wanted! Do you live in Yorkshire and have spare apples? We may be able to use them, and can offer cider in return. Thanks to all those who joined us last year – we now source our apples from over 80 locations around the area. Contact us to find out more about being involved this year. Come and find us in the ‘pip to press’ marquee at the Harrogate Autumn Flower Show this September. Our new labels are ready! Design by Kingdom and Sparrow and illustrations by Kitty Wingate. On display at the Tour de France stall. Welcome to our new look website… we’re trying some things out, so let us know what you think. You can also find us on facebook and twitter – links are on the contact page.